Constructed Wetlands are artificially created wetlands designed for the treatment of wastewaters, habitat creation or both. In the UK they are commonly referred to as as ‘reed beds’ due to the particular species of wetland plant used in these systems – the Common Reed (Phragmites australis). Natural wetlands have been utilised for centuries to provide treatment of wastewater, however the first recorded wetland to be deliberately engineered to provide wastewater treatment occurred in 1901 in the USA. 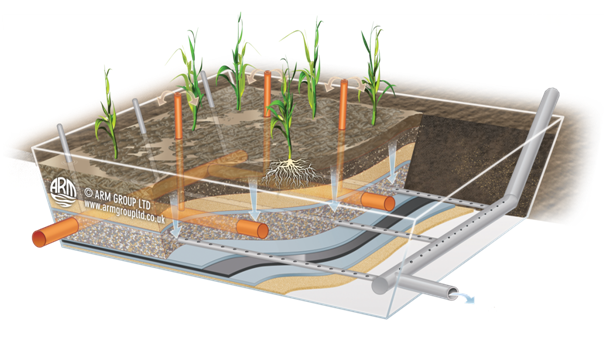 The origins of constructed subsurface wetland technology began in Germany in the 1950s at the Max Planck Institute by Kathe Seidel. Seidel had observed that the macrophyte Schoenoplectus lacustris had the ability to remove organic and inorganic substances from contaminated water, and further studies by Reinhold Kickuth in the 1960s lead to the concept of the Root Zone Method. These studies led to the first operational system being installed in Germany in the 1970s and then in the UK in the 1980s. Due to the ability for reed technology to work in even the “Coldest of Climates”, reed beds have been able to be adopted in countries where temperatures have reached -40c short term, and treatment has persisted. Constructed wetlands, though simple, can provide all the mechanisms for effluent treatment and achieve similar reductions in the concentrations of contaminants removed by more complex mechanical equipment or structures. One of the main benefits of installing a wetland is that it does not need power and the runnings costs are much lower (up to 10-50% cheaper than conventional treatments) and have low maintenance requirements. 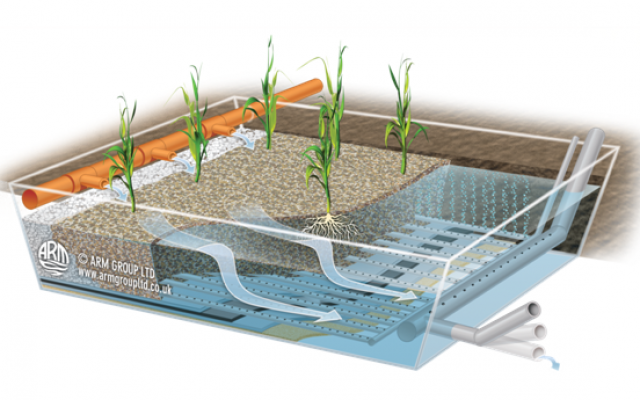 They offer minimal visual impact and provide a sustainable alternative to mechanical based wastewater treatments. 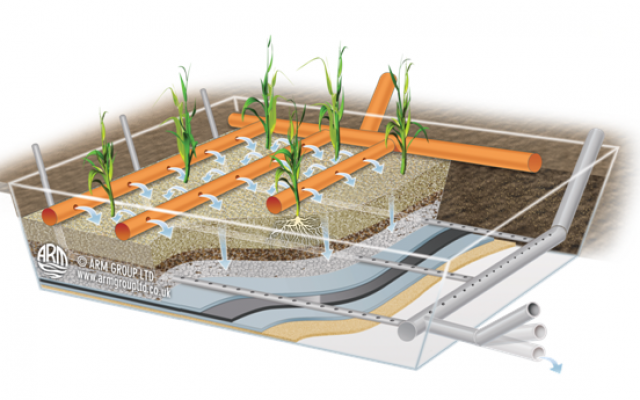 Constructed Wetlands are generally classified into categories depending on how the water passes through the system, surface (also known as free water surface) and subsurface. These categories can be further subdivided into horizontal flow and vertical flow paths. 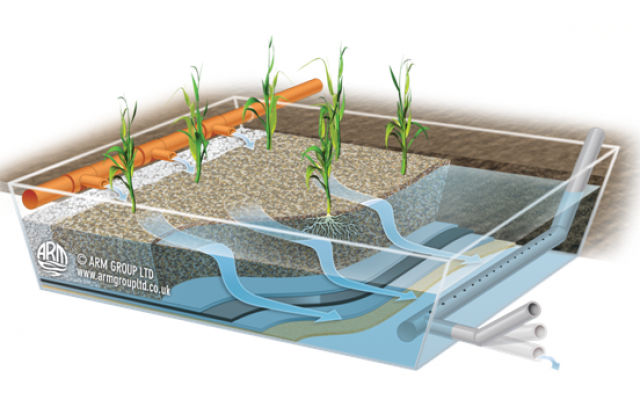 The Horizontal Flow (HF) Reedbed is the type that has been most commonly used to date. They are described as horizontal as the effluent enters one side of the bed and moves in a continuous process across the bed where treatment is effected by micro-organisms before being collected and discharged on the far side of the bed. HF systems can be operated in sub-surface flowand surface flow (also known as Free Water Surface – FWS) modes. Vertical Flow (VF) also known as Down Flow reed beds, are not as numerous in the UK as horizontal flow beds at present. The effluent is applied across the surface of the bed and drains down to the base of the bed. VF systems can be operated in a saturated and free draining mode. Both types can be used in combination where necessary. 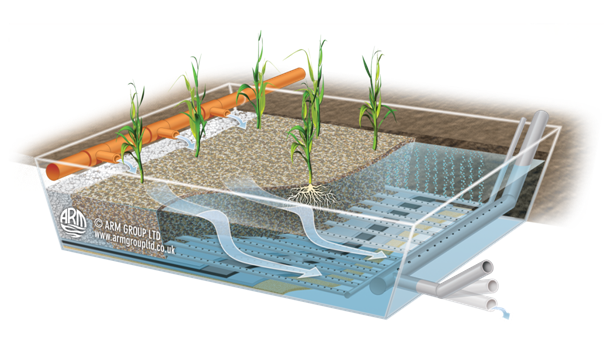 Sludge Treatment Reed Beds (STRB) have been used to treat sewage and drinking water sludges. 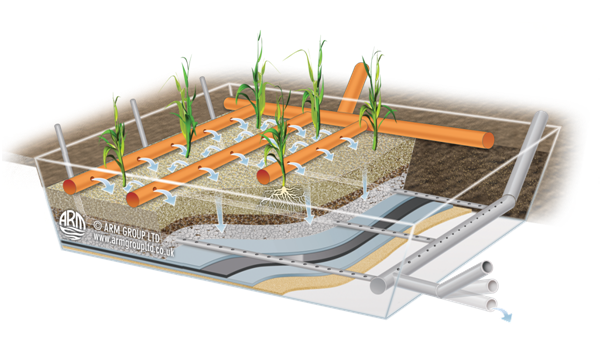 Developed from the planting of reeds into a pre- existing sludge drying beds, they differ from the conventionally constructed reed bed designed for the purpose of wastewater treatment, as the STRB’s basic function is to hold sludge, allowing it to dewater leaving behind a sludge cake. STRB share many design similarities with Vertical Flow (VF) reed beds in that there is a drainage matrix of graduated media in the base. Above the drainage matrix is a substantial freeboard for the accumulation of sludge sufficient for an operating cycle of approximately 10 years. Sludge is pumped on to the reed bed basin through a series of distribution pipes and over the previously dewatered sludge. 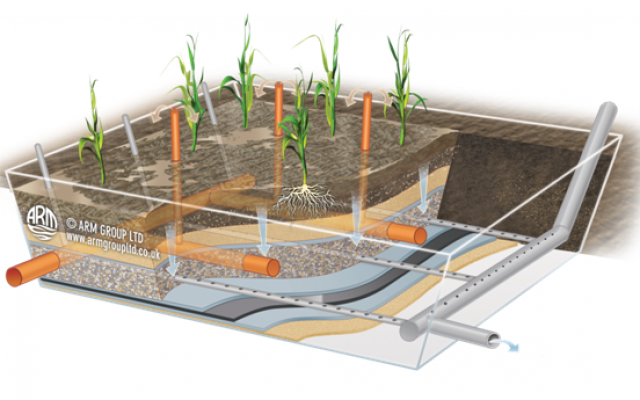 Over time, sludge reduction takes place in reed-planted basins. Due to dewatering (draining and evapotranspiration) the solids content of the sludge remains on the basin surface as sludge residue, whilst the majority of the water content flows vertically through the sludge residue and filter layer. 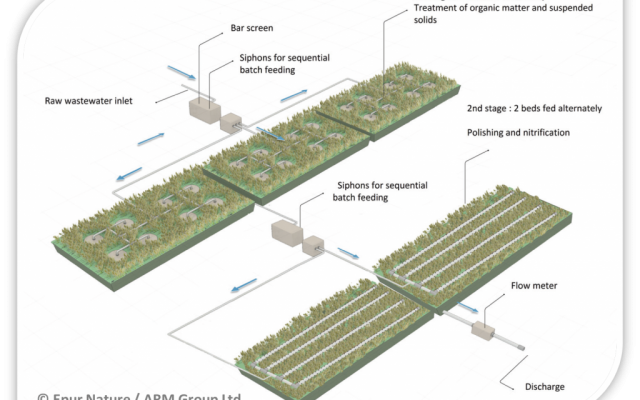 Phragmifiltre® wetlands can provide treatment to raw unsettled sewage.The Phragmifiltre® system comprises vertical flow constructed wetlands for the full treatment of sewage and has been successfully operating in France through Epur Nature and SINT since the 1990’s. To date there are over 800 Phragmifiltre® systems treating raw sewage from 20 to 5,000 PE (Population Equivalents). 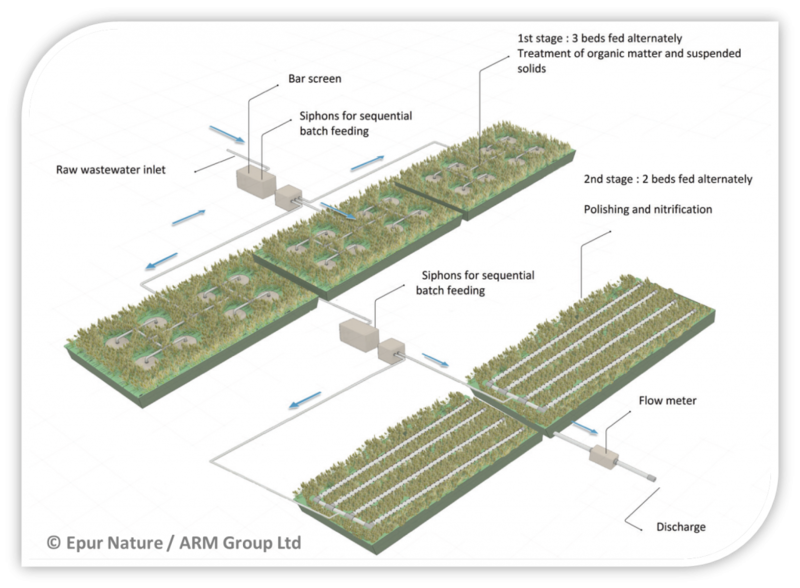 ARM Ltd in association with Epur Nature and SINT in France are proud to be bringing this technology to the UK. FBA ™ (Forced Bed Aeration™) is a wastewater treatment technology which enhances constructed wetland treatment performance.Forced bed aeration was Developed in the USA by our partners Naturally Wallace, we introduced the technology to the UK in 2009 and now have several aerated reedbeds treating sewage and industrial effluents.these wetlands are engineered to increase oxygen availability by installing air distribution lines at the bottom of the wetland to enable air to be forced through the bed media to increase the oxygen transfer rate, which results in increasing the treatment capacity by up to 15 times – allowing the treatment of stronger effluent such as effluent with high BOD and ammonia concentrations, or reduction of the total footprint of the system. Constructed wetlands are planted with aquatic plants which grow in or near water (emergent macrophytes). The most common species used in treatment wetlands in the UK is the common reed (Phragmites australis) and the broadleaf cattail (Typha latifolia); however, other aquatic plants may be used. The plant roots provide channels which help the water to pass through the matrix, and a small amount of oxygen is introduced into the root zone which allows for aerobic bacterial decomposition of organic pollutants in this zone. These wetlands contain a matrix (also known as substrate) into which the reeds are planted. This matrix consists of gravel, sand, soil, composite media or reactive media such as blast furnace slag or LECA (Light Expanded Clay Aggregates) for metal removal. Micro-organisms attach themselves to the surface of this media, therefore the greater the surface area, the greater the potential for microbial contaminant removal. There is a fine balance between maintaining microbial numbers and hydraulic conductivity (the measure of water flowing through the matrix).